The GREEN MARKET ORACLE: Are Under Armour's Sustainability Claims Green or Greenwashing? Baltimore based Under Armour, Inc. is a sports apparel manufacturer that makes a number of bold claims about their commitment to sustainability. However, their environmental performance has been widely criticized. Under Armour's website makes audacious claims starting with the well worn cliche that sustainability is woven into the company's DNA. 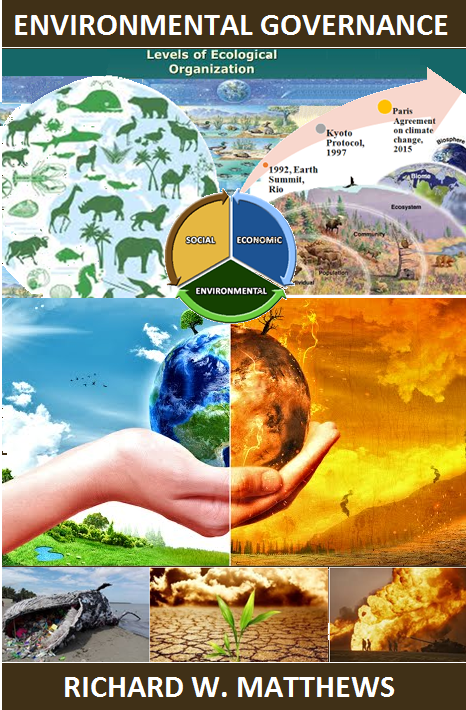 They also state that sustainability is integral to their strategy and directly related to the company's core values. The athletic apparel giant claims their sustainability vision, systems and practices have grown with the company and they further claim that they are focused on continuous improvement and actively seeking ways of adding value to the communities they serve. They specifically proclaim that they are constantly enhancing their materials usage and design process in pursuit of cleaner and healthier environments. They add they are working to upgrade their sustainable practices in their corporate, retail, logistics, and manufacturing operations. As explained on the Under Armour website, "Just like the athletes we serve, we always look to improve our performance." Under Armour claimed it joined the Sustainable Apparel Coalition (SAC) as part of their efforts to minimize their environmental impacts throughout their supply chain. The company proudly proclaims that it has partnered with the Fair Labor Association (FLA) to support the efforts of third-party manufacturers to develop sustainable solutions (the overwhelming majority of their products are built by independent third party manufacturers). According to their website, the clothes and shoe manufacturer collaborates with a network of business partners to address some of the big sustainability challenges. They also claim to work closely with their suppliers to ensure adherence to the guidelines contained in their Supplier Code of Conduct. Even though these guidelines include clauses on forced labor, Under Armour has been accused of using cotton derived from slave labor in Uzbekistan. However, this is only the tip of the greenwashing iceberg. Under Armour was deemed to be the worst performing company in the Environmental Dimension of SSC’s Peer Benchmarking Analysis. Based on the companies' website and reports the SSC evaluates a company's sustainability. Under Armour had the weakest scores in their sector in all aspects of the Environment dimension. They secured the worst score among their peers in the water category. They also had the weakest score in the energy and climate change category. Under Armour was the only company not to mention waste and recycling in their website. Unlike Nike and Puma, Under Armour made no mention of land use or biodiversity. The overall results for the environmental dimension of the SSC analysis show a tremendous gulf between Under Armour and its competitors. Nike came in first in the environmental dimension with 20 points followed by Puma (19), Adidas (14) and Lululemon (10). Under Armour came in a distant last with only 4 points. According to RankaBrand Under Armour gets a "don't buy" or "E" grade on sustainability. Under Armour received the E-label, because their website addresses only three out of 63 questions about their sustainability performance. Under Armour under-performed all of its competitors including Nike, Puma, Adidas, Reebok, New Balace, Hanwag, Mammut, engelbert strauss, KangaROOS, Ellesse, Helly Hansen, Timberland and Volcom. Activists from Rainforest Action Network’s (RAN) targeted Under Armour and other fashion brands for making clothes that destroy forest, contribute to human rights abuses and cause climate pollution. The Ethical Consumers rating was not all bad for Under Armour. The company got an average rating for its use of tax avoidance strategies. Although Under Armour has been criticized for its failure to provide sustainability metrics it does appear to be moving in the right direction. The organization is undergoing a company-wide process to create a framework for tracking the right sustainability metrics for their Port Covington Campus. Under Armour has begun a formal materiality assessment process aligned with the Global Reporting Initiative (GRI) G4 guidelines. Under Armour also wins awards. 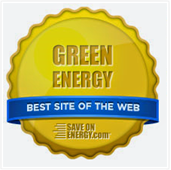 They were named one of the top green brands for customer loyalty. Their top 50 ranking in the Customer Loyalty Engagement Index is for company's that are perceived as "authentically and resolutely green by their own customers." In 2016 the Small Business Administration (SBA) awarded Under Armour and CEO Kevin Plank SBA the first Hall of Champions award. Under Plank's leadership, Under Armour has increased their efficient use of resources. Plank has also been a forthright advocate of inclusiveness. When Trump defended the alt-right after the Charlottetown tragedy, Plank was among a group of CEOs who resigned from the president's business council in protest. 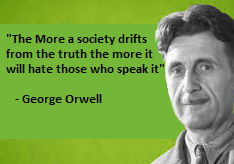 However, what little they are doing on the sustainability front is far outweighed by what they have yet to do. This is made worse by their unsubstantiated claims. Greenwashing can have adverse consequences and this may be playing a role in their declining stock values. Under Armour shares are the biggest losers on the S&P 500 Index in 2017. As reviewed in a Forbes article by Sarah Halzack, Under Armour's "blockbuster" growth is slowing. Sales in its core footwear division declined on a year-over-year basis causing the company to cut its revenue forecasts. Compared to its competitors Under Armour is performing very poorly. While sustainability focused competitors like Nike are enjoying strong sales from their footware division Under Armour is falling short. Companies with measurable sustainability performance metrics may have an edge. Consider the example of Amadeus a sustainability focused company who is keeping investors happy with strong returns. 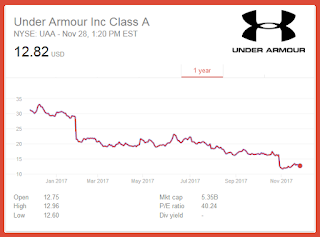 Conversely, Under Armour's failure to provide sustainability metrics may have contributed to the poor performance of its stock. Under Armour says it sees environmental and social sustainability as a journey. As they claim on their website, sustainability is not just about who we are now it is about who we will be. If Under Armour is to turn their comittments into reality they better get busy soon or they risk getting left behind.